Our IP is RSGTekkit.net <-- Connect for 24/7, lag free fun! Our Website: redstonegaming.enjin.com <-- RSG = Redstone Gaming! What can RSGTekkit.net offer YOU? We have a multitude of features which make us not only unique, but the best choice when it comes to having the ultimate Tekkit Classic experience! Mini-Games to Keep You Entertained! Our main world is our economy world. This has proven to be our most popular over time. However with RSGTekkit.net, you are not limited to just this play style! In fact, you can just jump over to /warp hub, and go through one of many portals giving you an amazing and new experience in just seconds! The beauty of RSGTekkit.net is that you can build safely in our economy world, utilizing strong anti-grief tools to keep your base safe. When you get together with friends, you can hop onto the anarchy world to wreak some havoc - and when you are done you safely return to your base in the economy world! Economy based play not your style? Then make our PvP world your home-world! Our PvP world offers factions to band together with friends, to fight off enemies and claim your land. All while knowing not only can you take a step to the more extreme side of anarchy whenever you wish without risking your PvP world belongings and knowing you can still access the inter-world mall to take part in the economy! RSGTekkit.net offers this unique experience that no other Tekkit Classic server can. We have 100 slots, guaranteeing that we will won't ever fill up completely! Grief, Raid, Pillage, Who Cares! So What Are You Waiting For? Join IP: RSGTekkit.net Today! Finishing up our giant hub spawn! Background: Some staff members of my server were playing on this server for a good amount of time to be able to play legitly. I joined and played for a while, then after my staff members decided to go and blow up some stuff, I was banned along with them. They banned me because they believe I sent them there. I'm not sure why they're so schizophrenic and have this belief, however I do not babysit my staff nor my player base. Because when your staff don't tell us they are from your server, ask over and over if they can help us so we do (thank god we didn't give them op..) then they help us for a few minutes then when we are not looking they destroy all of our projects while spamming "FCoFix blah blah" that would lead one to assume they are doing it because the only way you are able to promote your server is by putting every other server down and acting like the Tekkit Classic police on the forums. Once again, that's on their own accord. I did not sanction their actions nor did I know about their intentions to do so. 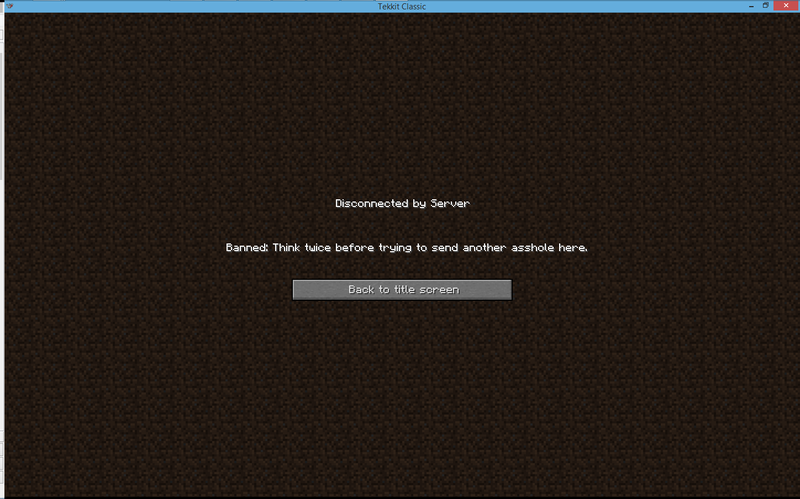 I'm sorry your server got griefed, however blaming me for activities I have no control over. If you believe I'm "mini-modding" (the word you were looking for? ), too hard then please report me and let the forum admins decide. Sure, I might be a bit harsh when I post negative things, however I try to stay away from opinions (although, I'm not free of them) in my negativity to give a truly honest negative review. If I was to post honest thorough reviews for every server I joined (which is quite a lot), I would have no time to run my servers. If I ever find a truly remarkable server that goes above-and-beyond my expectations, I will write a positive and thorough review on it. Until that day, I will tend to focus on negative things as they're more usable feedback on what the server needs to improve on.